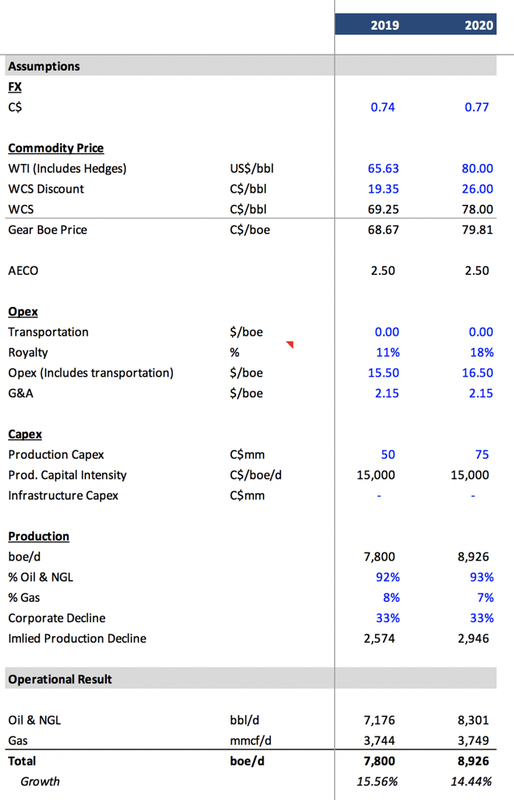 Gear Energy is far too cheap today with a projected 2019 free cash flow yield of 24% at current oil prices. If WTI averages $70/bbl over the rest of the year, Gear would see free cash flow totaling C$55 million or a yield of 33%. This undervaluation is clearly unsustainable. With the H1 budget designed to reduce debt, if the shares remain cheap in H2 2019, we will push very hard for a share buyback plan. We see the fair value of Gear at C$1.74 this year and C$2.49 in 2020. Since we've started investing in energy stocks, the number one variable value investors used to always point to that made them shy away from energy stocks was the "lack of free cash flow." Well, that's not true anymore. While the apathy towards energy stocks, in general, remain extremely high, the free cash flow yield so sorely desired by investors is finally shining through via the dirt cheap energy stock valuations. Before, we used to describe Gear Energy (OTCPK:GENGF) [GXE.TO], our second largest investment, as trading at an absurd EV/EBITDA multiple. Today? It trades at a free cash flow yield of 24%! While as eye-popping as this may be, the sheer stupidity of the market is that the undervaluation of energy stocks has gone so overboard, some of these companies could buyback one-third of the company if it chooses. In the case of a name like Gear, the unfortunate event is that the shares don't trade enough volume to allow it to buy back so many shares. In addition, management has already announced the priority of paying down debt first, which, by the end of June 2019, should see the debt to cash flow fall below 1x again. With WTI now trading over $64/bbl and the next 9 months expected to average ~$64/bbl, Gear should see free cash flow come in around ~C$43 million on capex of C$50 million. In H1 2019, Gear is expected to spend C$10 million, with production averaging ~7,300 boe/d. In H2 2019, we expect Gear to spend C$40 million to boost production. The C$40 million would yield roughly ~2,000 boe/d of new production with ~1,000 boe/d going to replace existing production base decline. Depending on the timing of the production ramp, we expect year-end exit volume between ~8,500 boe/d and ~9,000 boe/d. 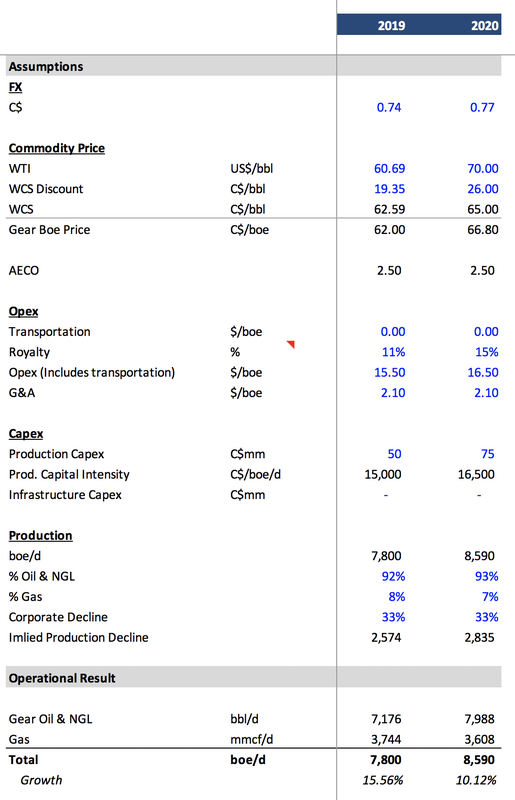 So, if we use flat oil prices and the same WCS-WTI differentials currently embedded in the futures price, Gear trades at 2019 pro forma 2.3x EV/EBITDA and has a free cash flow yield of ~24%. What happens if WTI averages $70/bbl over the next 9 months? If WTI averages $70/bbl over the next 9 months, we estimate Gear would produce ~C$55 million in free cash flow on capex of C$50 million. That's a free cash flow yield of ~33% and EV/EBITDA of 1.8x. Clearly, the current stock price is unsustainable if WTI does rise to $70/bbl, but this undervaluation only goes to illustrate the sheer insanity of the market today. With the share price currently trading at C$0.78, we estimate that the market is embedding an oil price assumption of $48/bbl in Gear, or $16/bbl below where WTI is trading at today. This is quite an absurd assumption, considering that the macro oil outlook continues to improve with the Saudis in the driver seat. In addition, WCS-WTI differentials may be completely overstated after the summer given the illiquidity of the futures curve. What's obvious to us is that the market's embedded assumption to arrival at Gear's share price today is faulty at best. Using a probability-weighted oil price scenario, we arrive at a fair value of C$1.74 or 123% higher than where it's trading at today. For 2020, we arrive at a probability-weighted price target of C$2.49 or 220% higher than where it's trading at today. In our view, the sheer undervaluation today doesn't make sense from leverage, operational, or managerial viewpoint. We believe the market is just ignoring a name like Gear for the sake of ignoring it. But with the company generating so much free cash flow at current oil prices, it won't be able to ignore it for much longer. For the first half of 2019, Gear should use the FCF to pay down debt. 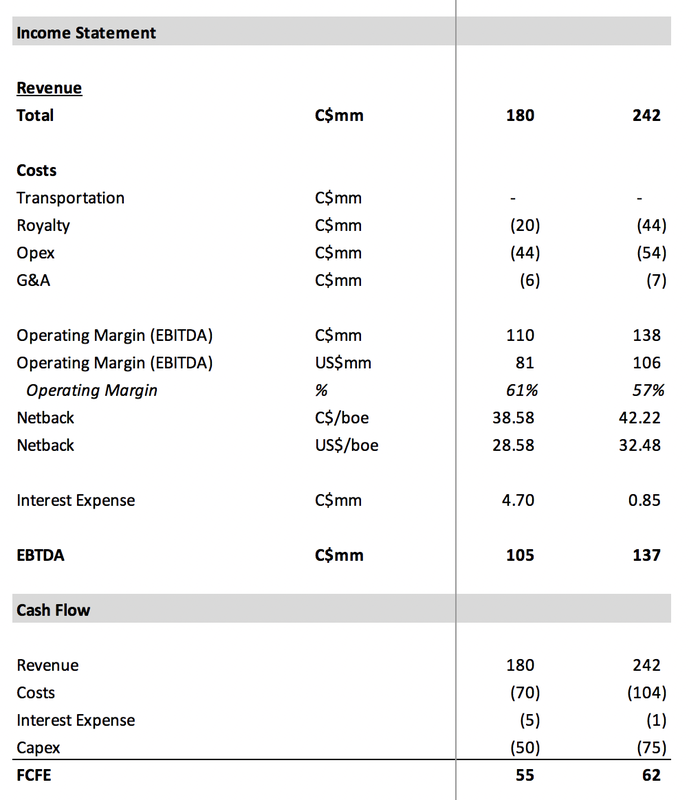 Following the acquisition of Steppe, Gear put itself in a rather uncomfortable position with net debt reaching ~C$90 million. With oil prices where they are today, Gear should be able to bring the debt down to C$62 million by the end of June. 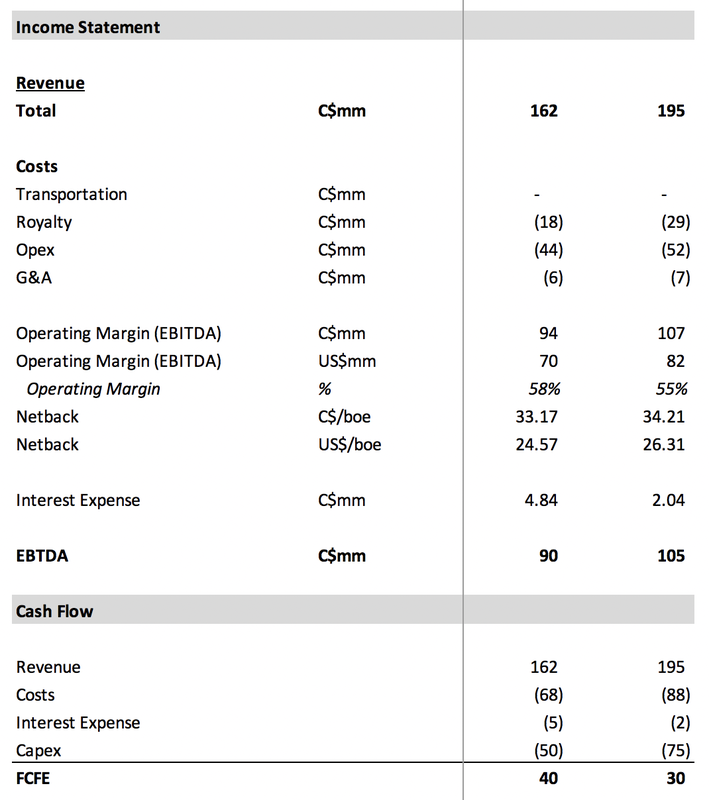 With debt below 1x D/CF again in June, Gear will have flexibility again with its cash flow. In our view, Gear should spend C$40 million in capex to increase production but leave enough FCF to be flexible. If the share price remains cheap by June, we will be pushing very aggressively for a share buyback plan. We have echoed our support for the H1 capex budget and the determination to pay down debt, but we have also expressed that if the share price remains cheap by June, we think Gear should buy back shares. We believe the management incentive is aligned for a much higher share price, and if the oil market environment allows, Gear will start to reward shareholders. Gear Energy is far too cheap today. With a pro forma 2019 free cash flow yield of 24% at current STRIP oil price, Gear will be able to bring debt to cash flow below 1x by June. The second half will see Gear increase production while also making enough money to give it optionality to repurchase shares. We think the undervaluation is not sustainable here. Our fair value price for 2019 is C$1.74, and our 2020 fair value is C$2.49. Thank you for reading this article. HFI Research subscribers received this write-up on April 4th, a week before it was made public. If you would like to start receiving our exclusive idea write-ups, please consider signing up for HFI Research premium. We are currently offering a 2-week free trial, so come and see for yourself. Disclosure: I am/we are long GXE.TO. I wrote this article myself, and it expresses my own opinions. I am not receiving compensation for it (other than from Seeking Alpha). I have no business relationship with any company whose stock is mentioned in this article.